Select some code, type a question or comment, and start a discussion that will be forever connected to that block of code by a “codemark” left behind in your source file. CodeStream makes talking about code, and building a knowledge base in the process, completely effortless. With the introduction of new types of codemarks there are even more ways to build your knowledge base, all designed specifically for developers. Issue – CodeStream can be thought of as a lightweight form of continuous code review. See some code that needs some work? Select the code, create an issue and even assign it to someone to ensure it gets resolved. Code Trap – Have a critical piece of code that shouldn’t be changed without you knowing about it? Maybe something related to security, billing or privacy? Select the code and create a trap to let people know that any changes should be discussed first. Bookmark – Save bookmarks to quickly access key parts of the codebase. Use different colors to label them with additional meaning. Red issues are critical. Green bookmarks are for the newbie developers. You get the idea. You can still find “Add CodeStream comment” in both the light bulb and context menus, but you can now add a codemark by simply selecting some code in your editor. 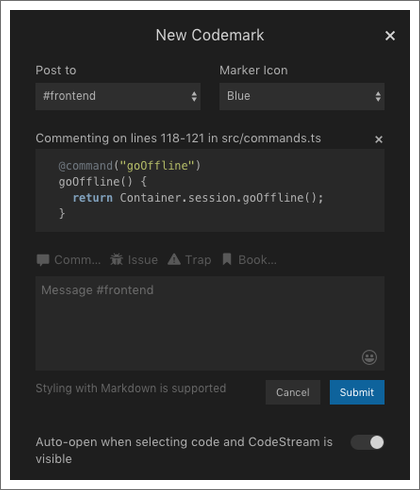 The form to post a codemark will pop up in the CodeStream pane automatically. You can turn this behavior off via the toggle at the bottom of the form. Displaying your team’s codemarks as annotations in the source files makes sure that the right person sees existing discussions at the right time, but the new “Codemarks” tab allows you to explore your team’s knowledge base in new ways. Look for the search icon in the header to find a specific codemark. When you combine the different types of codemarks with your ability to share to different audiences (i.e., channels), and even the ability to label them with colors, your knowledge base becomes more flexible and powerful. Check CodeStream’s wiki for more details on how to use codemarks and leverage your team’s knowledge base. 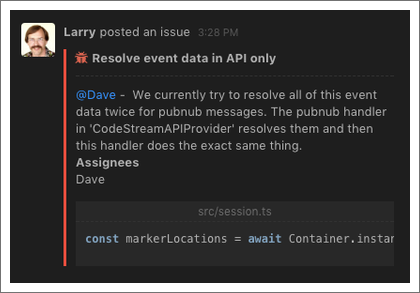 Note that if your CodeStream team is connected to your Slack workspace you’ll need to take action to migrate your existing discussion markers to codemarks. Learn more. 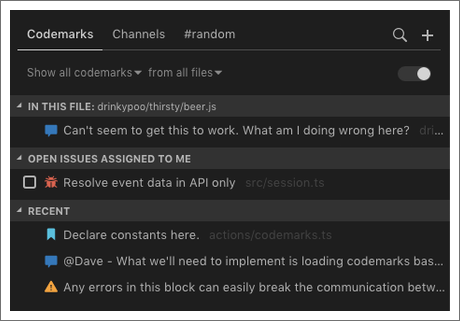 CodeStream 0.30 has been released, now with "CODEMARKS" ? 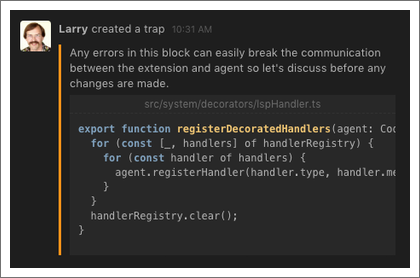 Create living links in your code to comments, issues, code traps, and bookmarks!